While Teresa Eyring's editorial "How Theatre Save America, Part 1" highlights the wonderful artists of the Network of Ensemble Theatres, and pays particular attention to the Bloomsburg Theatre Ensemble, whose long-time member Elizabeth Down I had the pleasure of sharing a post-show panel discussion with following Mike Diasey's June 15th performance of How Theatre Failed America, the fact is that American Theatre Magazine devotes all too little of its space to such regional ensembles. A tally of your recent issues reveals a fixation on theatres in New York, Chicago, and Los Angeles, and even when you do feature a theatre not from those areas the article is usually written by a writer from New York, Chicago, or Los Angeles. Perhaps the real title of Daisey's piece ought to be How American Theatre Failed American Theatre. Your magazine needs to walk your talk, Ms, Eyring. You and your magazine could be leading a long-delayed renaissance in the regional theatre through a rediscovery of the original impulse as expressed by Margo Jones and Zelda Fichlander, among other; instead, you are trying to sandbag it. Everything is NOT all right. belief in the music combined with an ability to explain it so that others can experience what he hears is just amazing. Watching this is a reminder to me to focus on what is important. If I could do what Zander does, and explain things in such a way as to make the experience of a play magical, I would be making such a difference. And if I could nurture within myself Zander's attitude, which I have at my best, I could lead so much better and teach so much better. It is so very hard to focus on the love and not on the irritation, to focus on what is right instead of what is wrong. I fall into the anger and frustration and forget about the fact that most people are of good will and are trying. Perhaps the goal is to surround yourself with things that remind you of this, so that you can stay afloat as often as possible. I don't know. But I was moved by this speech, in both the emotional and the spatial way that I discussed in the post below. How, indeed, can we speak only those words that could serve as the last things we would say to someone? It is impossible, but if we tried to move more in that direction, what might it change? "And, if what the Prof says is true - that I have a responsibility to the community in which I live - is my responsibility to provide art that is "in the public's interest" or to provide art that "the public is interested in?" I'm going to try to rephrase this sentence as I understand it. If I get it wrong, I hope Don will correct me and then I'll try again. Let's start with the premise that an artist has a responsibility to the community. While phrased in terms of the artist, I think all people, artist or not, have a responsibility to improve their community (even if that is just one other person), and thus through the ripple effect the world. However, there are many ways to improve a community (not simply through addressing socio-economic issues, for instance, which is how this idea is all-too-often interpreted), and truth be told there aren't many plays that don't do this to some degree or other, whether in the avant garde or the mainstream. When the Communist leaders of East Germany tried to get Brecht to change the ending of Mother Courage to provide a positive message, Brecht argued persuasively that people could learn as much from a negative image as a positive one, which of course is the tragic vision. When we see Oedipus' fall, we are reminded through his negative example of how small is our understanding and power as human beings, and the result may be greater humility. So this "responsibility" that I have argued for is not an argument solely for upbeat, optimistic art. So what, then, is this responsibility? I agree with Viktor Shklovsky's idea that "art exists that one may recover the sensation of life; it exists to make one feel things, to make the stone stony." Or as anthropologist Ellen Dissanayake writes in Homo Aestheticus: Where Art Comes From and Why, the core of art is "making special." Again, there are many ways to do this, positive and negative. I am reminded of the opening sequence of the film Blue Velvet, which moves from the image of a bright, happy suburban scene down into the grass where we see a severed ear, an image which says in a few short moments what the rest of the film reiterates: that we can't become complacent about the Good Life because beneath it lies a world of violence and sickness. On the other hand, making the stone stony may involve drawing our attention to details of life unnoticed, as in the Gerald Manly Hopkins poem: "Glory be to God for dappled things -- / For skies of couple-colour as a brinded cow, / For rose-moles all in stipple upon trout that swim, / Fresh firecoal chestnut-falls, finches' wings." Or what Virginia Woolf called the "little daily miracles, illuminations, matches struck unexpectedly in the dark." To make the stone stony, then. one must work with the idea of figure and ground -- that in order to be seen, an object must stand out from its background. A match glows most in the dark, and a picture of a polar bear in a blizzard is, after all, simply a blank piece of paper. This is where an understanding of community comes into play, for the community provides the background from which the artist must draw a contrast through his or her work of art. To simply reproduce the values and perceptions of the community is to disappear, and thus to make no contribution at all. This is the problem, for instance, with some mainstream art: it blends into widely-accepted values without adding anything. Which may be the answer to Don's question about art that "the public is interested in," if what he means by that is art that the public is so comfortable with that it fails to stand out from the background. Many people will seek out such art because they believe it will make them happy. But truth be told they often come away feeling as if they have wasted their time and money, sort of like how one feels after eating a whole lot of cotton candy. It seemed like a good idea at the time... I happen to believe that we live in a culture that emphasizes violence, conflict, materialism, and cynicism, and so in order to make the stone stony I must create art that stands out from that ground in some way. But if the art "the public is interested in" (as defined above) isn't the answer, neither is its negation: art the public ISN'T interested in. Because unless there is someone compelling attendance, no matter how profound the work of art it will have no effect whatsoever if nobody sees it. Which is the problem of some avant garde art, which stands out from the background through sheer negation in a way that results in lack of harmony and thus in ugliness. The spectator recoils, and thus is not changed in any way because the image has been refused, rejected, blacked out. In that situation, the spectator emerges from the event unchanged, no better than if they had chosen the cotton candy event. So art may exist at a midpoint between these two extremes. Which, strangely, brings me to Richard Schechner, who rather famously talked about performance artists as being "not not themselves" onstage. Not his actual self, nor a character, but a hybrid. In other words, a double-negative is not a positive. (I think my head just exploded.) Let me try it this way: if asked if I am religious or not religious, I might say I am not not religious, which is not saying that I am religious -- it is more ambiguous. And perhaps this is what art "in the public's interest" is: art that the public is not uninterested in, that offers some initial attractor that gets the spectator in the door, and that proceeds to move the spectator by making the stone stony. All of which is probably more than Don bargained for. I suspect what he was asking was whether he had a responsibility to "give the public more of what it thinks it wants": my answer is no. There is a difference between "wants" and "needs," as any nutritionist will tell you. Artists need to tap into a community's needs, which still involves listening very, very carefully for the hopes, dreams, and pain of one's fellow man. Art and artistic expression shouldn't be the jewelry of society, it should be part of the blood, part of the muscle, and part of the bone. When our strategies set us apart from the world so that we can be separately admired, supported, and valued, we shouldn't be surprised when we are perceived as separate. 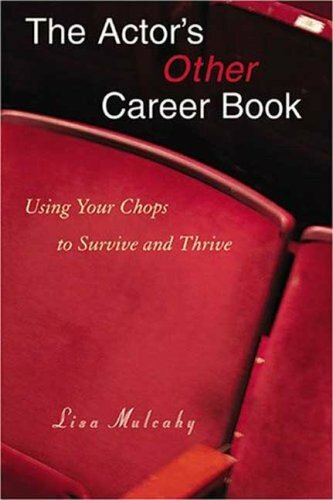 I ran across Lisa Mulcahy's 2006 book The Actor's Other Career Book: Using Your Chops to Survive and Thrive at my university's library, and I grabbed it with great relief. As any of you who have followed this blog in the past know, one of the ideas that is part of the theatre tribe model is that the tribe coordinated the ancillary income, of what I call "And Then." This idea is that theatre artists have many talents and skills that are valuable, and that it is wiser for the tribe to receive the benefit of those skills and talents instead of outside employers. Mulcahy had the same idea. The Actors Fund’s Actors Work Program (AWP) assists entertainment industry professionals in identifying and finding sideline work and new careers. AWP is a comprehensive employment and training program committed to fostering resiliency and self-reliance for industry professionals as well as providing a resource for referral of highly skilled and creative workers to the larger employment community. Through AWP services, clients can develop rewarding sideline careers in such areas as teaching, administrative support, healing professions, and real estate. Often, working professionals need to work outside of the industry to support the continuing pursuit of industry work. Many of the skills that entertainment industry professionals have – communication, discipline, creativity, flexibility, professionalism – are highly valued in the broader labor market. The Actors Work Program helps to identify and apply these skills to other work settings. Mucahy's book interviews many of those who have taken advantage of AWP. Each person describes their theatre background (so you understand that these are successful artists who have chosen the AWP route), and then they talk about their "other career." These include teachers, nurses, consultants in public speaking, non-profit organization spokespeople -- even the national education and outreach coordinator for Actor's Equity. Most of these artists started out being unable to imagine a second career that would be as satisfying as theatre, but they all are surprised to discover that their sense of who they are and what they do can expand to fit a broader self-conception. From my perspective, this book is a valuable source of ideas for "and then" opportunities. Some are full-time, or more than full-time, careers that leave little room for other pursuits, but others have flexibility and creative possibilities that would be very advantageous to a member of a theatre tribe, and would pay much more than the usual "day jobs" that theatre artists often work. The interviews -- or really monologues -- give you a clear sense of the personality of each person, and makes for lively reading. Unfortunately, the AWP is only in NYC and LA, and is only available to members "in good standing of any entertainment industry union, a referral from the Fund’s social service department, a client of CTFD, and others who can document substantial entertainment industry work." However, It is my hope that either Mulcahy or a representative of AWP will be willing to serve as part of the advisory panel that will help me flesh out the theatre tribe model. "I felt like I couldn't stay in show business and get married. I felt those things were mutually exclusive. I don't want to go out and be on the road in my first year of marriage -- it seems like that's shooting myself in the foot, because day to day is when I need to build what I'm going to have for the rest of my life. I didn't realize it was just as important to put time into that as going to a tap class or a singing lesson. I can't imagine right now being in a Broadway show and trying to maintain a house and a husband and a dog. I think about if I want to have children, and where that would put me." If you think that Mike Daisey exaggerates the situation in his show, all it takes is reading that paragraph to understand the choices that actors are forced to make. I don't believe theatre and marriage have to be mutually exclusive, but the current way the "industry" is run creates a sense that they are. And the theatre tribe is committed to finding a new way where someone like Fletcher doesn't have to make such painful choices. Mulcahy's book should give actor's (and other theatre artists) confidence that their talents are valuable and useful, and ideas about how they can use them in ways that help themselves, their tribe, and other people. 1. Investment. Putting in the time and effort necessary for a future return -- this is not a short-term fix, but a long-term commitment. 2. Commitment. You must be creative, tenacious, and focused. 3. Research. Quantitative and qualitative researcg tells you who the audience is. 5. Review and Analysis. Figure out what information you have gathered, and what to do with it. 9. Creating Value. It isn't just giving away free tickets. The effort is to "open the doors of your institution to diverse audiences and collaborate on programs they want to see." In other words, this isn't a one-and-done, February African-American slot type thing. You are investing in an ongoing relationship. 10. Appreciation. Thank your audience, yes, but truly appreciate their presence. 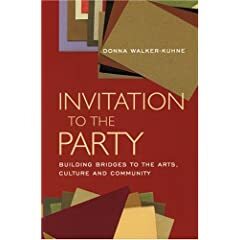 Walker-Kuhne provides several chapters that are case studies of audience development campaigns that she personally was involved in: the Public Theatre in general (especially George C. Wolfe's commitment to make the Public audience "look like a subway stop in New York City"), and s[ecifically Bring in 'Da Noise, Bring in 'Da Funk; Harlem Song, the Dance Theatre of Harlem. These case studies describe specific programs, but to my mind what this book more importantly does is describe clearly and passionately the importance and value of the goal and the level of commitment necessary to achieve it. "Many small arts organizations say they don't have the resources to build audiences. I believe they can't afford not to." She goes on in words that summarize the thrust of the book: "Create programming that reflects the interests and culture of your target audiences. Allow it to be a collaborative process. Nurture and cultivate your new relationships carefulyl and lovingly. Follw up every step of the way; continue cultivation until new audiences are bringing other constituents to your events....Talk to your communities. Be as creative as you can in enhancing and expanding your ways to communicate. If you are expecting them to participate, what are you giving back? Be active in your neighborhhod: sit on local boards or neighborhood associations. If there are block associations, contests or festivals, place yourself in the arena so that you'll gain knowledge and support and have visibility." I recommend this book as a starting place for anyone wanting to expand their audiences. While the advice is specifically about diversifying your audience, in many respects the advice is applicable to audience development in general.